Will anyone agree to travel without automobile, in the summer of 2007, from Beijing to Paris? After several months of high adventure eleven riders made it all the way from Beijing to Paris. We accumulated more than 140,000km between us, most of that human powered. Sixteen participants representing New Zealand, Australia, Taiwan, UK, Germany and Netherlands took up the challenge. Their chosen modes include combinations of boats, trains, touring bikes, standard recumbents, two home built recumbents, and a penny farthing. 3/4/2007: Arnold and Marieke depart Beijing, the expedition begins. 10/4/2007: Meng, Ulla and Heather leave Beijing. 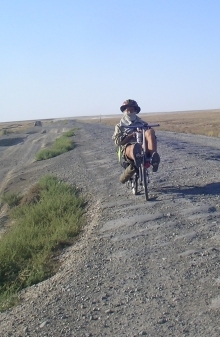 10/5/2007 Daniel departed from Paris (Daniel is riding B2P backwards) We hope to see him in central Asia somewhere soon. 11/5/2007 Joff’s Penny Farthing visits Tienmen square. See Joff’s Blog for pictures. 10/6/2007 Olly, Ting, The greenway team, Candice, Aaron and Frank, Su Chun, Liao Hung all left Beijing. 22/6/2007 Olly, Ting, Frank, Su-Chun have done 1,200km in 12 days but are holed up near Yinchuan waiting out the rain. Aaron is somewhere in Mongolia. 16/7/2007 Arnold and Marieke are in Kazakhstan, Meng and Heather in Kyrgystan, Olly and Ting waiting near Kyrgystan border, Aaron in Russia (wherabouts unknown), Frank and Su Chun both nearing Kazakhstan border via Urimuchi, Greenway team assumed still in Gansu, and Daniel (Paris to Peking) is in Iran. All going well. 14/9/2007 Heather Burge returns to Australia for the Birth of her first grandchild! Congratulations to Heather, for the new family member, and for reaching Istanbul. Heather hopes to complete the expedition at a later date. 14/9/2007 Arnold and Marieke Reach Paris. 13,692km, after five and a half months, all the way on their beautiful touring bikes. 22/9/2007 Aaron Huang reaches Paris. He was delayed by a head injury and surgery in Russia. He Traveled by bike, train and boat via China, Mongolia, Russia, Scandinavia, Europe. 10/10/2007 Olly and Ting reach Paris. Exactly four months (123 days), 12,600km, all on their home made recumbents. 11/10/2007 The Greenway team (Taiwan) reach Paris. 124 days. Traveling by bike, train and boat via China, Kazakhstan, Russia, Scandinavia. Europe. 16/10/2007 Yu Su-Chun reaches Paris. 12,738km by bike, plus bus, train and boat travel in Scandinavia, alone since Urimuchi. 6/11/2007 Meng reaches Paris, in 218 days, with a combination of boats trains, buses and riding 13980km by bike. Boat from Russia to Turkey, then through Eastern Europe, Austria, Germany and France. Finishing the last part of the trip in snow. 23/10/2007 Daniel Lang reaches Beijing.